Flashes and floaters are conditions within the vitreous humour of the eye. Floaters appear as small black dots or strands. They float in the vitreous humour which is the jelly-like substance contained within the eye. Floaters are of various shape, size and consistency. While they can be annoying, they are very common and are not usually any cause for alarm. How floaters may appear as you look at the sky. Some people may have had floaters for years and they are more common in short-sighted people. 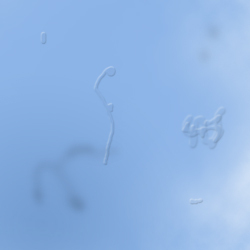 The number of floaters you have may increase as you get older but if you notice a sudden increase in floaters it is best to get it checked by your optician. Flashes of light can also be a common occurrence in the eye and as with floaters are caused by changes in the vitreous humour, usually as we age. This jelly-like substance shrinks as you get older and slowly starts to pull away from the retina causing a sensation of flashing lights. Although these symptoms can be annoying, this is a harmless process called posterior vitreous detachment (PVD). If, however, you see a sudden shower of floaters, especially if it is accompanied by the onset of frequent flashing lights, this could be an indication of a more serious problem like a retinal detachment. You may also experience a dark shadow or curtain across your vision following the onset of the flashes and floaters. These symptoms require immediate attention to check your eye. If your retina is detaching, then your optician will refer you urgently to a hospital to have it reattached. It is important that you do not ignore any of these symptoms, so if you have been experiencing even mild symptoms, it is best to make an appointment with the optician to get your eyes checked. If you experience any of these issues please refer back to our contact page.